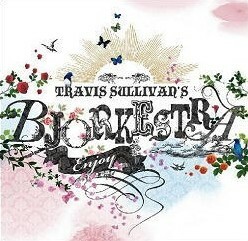 Travis Sullivan’s Bjorkestra is a genre bending jazz orchestra that interprets the music of Bjork Gudmundsdottir, one of the most influential pop artists of the past 20 years. The Bjorkestra transcends the boundaries of popular music and modern jazz, and continues to thrill and mesmerize audiences with its engaging blend of improvisation, brilliant arrangements, and danceable grooves. Whether you are a fan of Bjork or jazz, the Bjorkestra offers something for anyone interested in listening to innovative, creative music while having fun in the process. Travis Sullivan employs a traditional big band instrumentation augmented by female vocals and laptop programming. A live Bjorkestra show is a unique listening experience that impacts both the sonic and visual senses as they pay homage to the music of Bjork through invention, not imitation.